WELCOME TO Throne Kingdom! This is a fabulous and hand carved “Mini Tiffany Throne Chair” for children’s birthday parties, photo shoots, bedrooms, and much more! FEATURES: Solid Mahogany Wood Frame Stain resistant durable white vinyl Gold finish Crystal Bling Tufting Dimensions: 37″H, 25″W, 17″D Seat height is 11″ This chair is for children ages 1-8 or small pets. If something caught your eyes from our listings don’t hesitate to contact us for further information. You can message us anytime. Our friendly staff is happy to help you. Thanks! 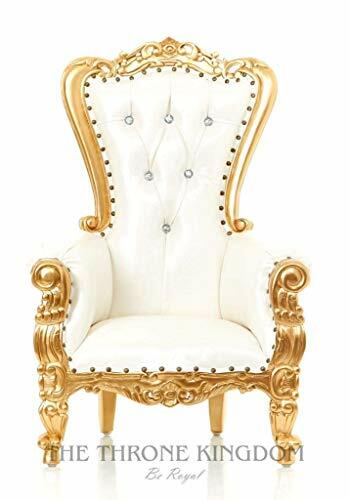 Purchase Mini Tiffany Kids Birthday Throne Chair for Children – Prince/Princess Throne Chair for Kids – Party Chair Rentals, Children Photo Shoots, Home Furniture – Gold Finish – 37″ H (White/Gold) at Discounted Prices ✓ FREE DELIVERY possible on eligible purchases. HAND CARVED FROM MAHOGANY WOOD: This stunning chair is build with mahogany wood which is the best choice for furniture. This will last much longer than any other quality chair. NAIL HEAD TRIMMING: This special feature holds the vinyl in place and will enhance the integrity to look more beautiful for much longer! CRYSTAL TUFTING: Add bling to your chair! Crystal tufting is the most popular choice to beautify this chair and your party! DURABLE VINYL: This chair is made with special vinyl sourced from the highest grade qualities. Its meant to repel any substance that can stain your chair forever. Also easily cleaned with any cleaning products! 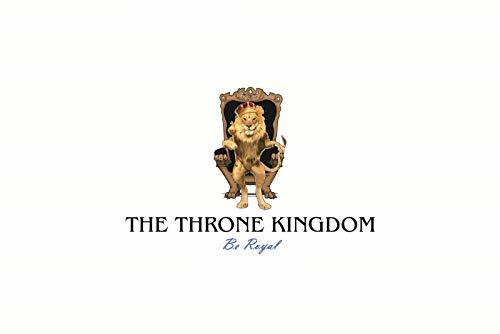 Overall Dimensions: 37"H, 23"W, 17"D Seat Height is 11"
WELCOME TO Throne Kingdom! This is a fabulous and hand carved "Mini Tiffany Throne Chair" for children's birthday parties, photo shoots, bedrooms, and much more! FEATURES: Solid Mahogany Wood Frame Stain resistant durable white vinyl Gold finish Crystal Bling Tufting Dimensions: 37"H, 25"W, 17"D Seat height is 11" This chair is for children ages 1-8 or small pets. If something caught your eyes from our listings don't hesitate to contact us for further information. You can message us anytime. Our friendly staff is happy to help you. Thanks!